These cookie bars are easy to make. You don't have to worry about them spreading, so you can start with melted butter and soft dough. You can mix it by hand with no problem, no need to pull out the stand mixer or anything! Just spread it, bake it and load it with frosting! There is the warm depth of molasses and just a slight cinnamon spice. 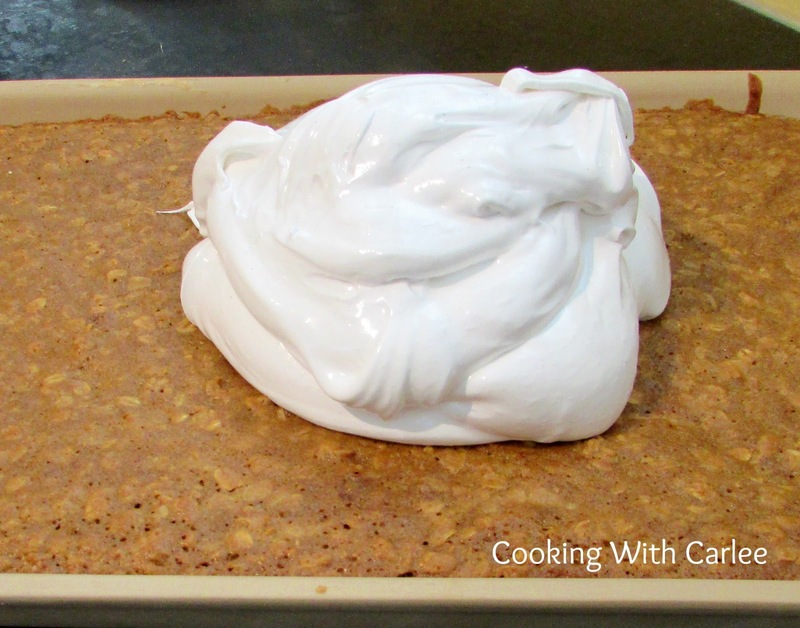 It is a great compliment to the marshmallowy seven minute frosting. Preheat oven to 350 F and grease a 10x15" bar pan. Stir together butter, brown sugar, molasses and vanilla. Add eggs and mix well. In another bowl, stir together dry ingredients. Add dry ingredients to wet ingredients, stirring until just combined. Spread in prepared pan and bake for 25-30 minutes or until set. Allow to cool and spread with frosting. Ooooo boy these look good! Oh my goodness these look so scrumptious! The best part for me is that I have everything to make them on hand, so no trip to the grocery store needed! That does make it so much better! Having to run to the store for that one missing ingredient is the worst. I hope you love them! I have all the ingredients - yay so I'll be able to make this recipe. Thanks for sharing with us at #Overthemoon Carlee great to have you linking up as always. Hooray! I hope you love them! Thanks so much for hosting. These sound awesome! Thanks for sharing at Inspiration Thursday! I really enjoyed them. Luckily I had a group to share them with or I might have eaten the whole pan! I've never had this kind of bar! I need to try this asap! The molasses really makes it taste like the oatmeal creme pies! I hope you love it! Yum yum and yum. If I had known these existed back in the day I would have insisted I get one for lunch. As it was, I packed salami and cheese sandwiches with yellow mustard. Good, but not quite the same ;-) Thanks for linking up at #SaucySaturdays! They are so good! Though a salami and cheese sandwich doesn't sound half bad about now. I think I am ready for lunch! This sounds SO delicious! YUM! I've pinned it! They didn't last long, that is for sure! Thanks, Jess! Oh these look amazing. This is a childhood favorite, for sure! Thank you! They definitely bring back memories! This looks and sounds so delicious and healthy too. Thanks Carlee for joining and sharing your awesome recipes with us each week at Cooking & Crafting with J & J. Better than the ones in the packages at least! Thanks for hosting! I've never had this type of bars. Will have to give this a try. Thanks for sharing on Merry Monday. Thank you! I love the flavor of the molasses with the oatmeal. The molasses and cinnamon really help warm up the flavor! 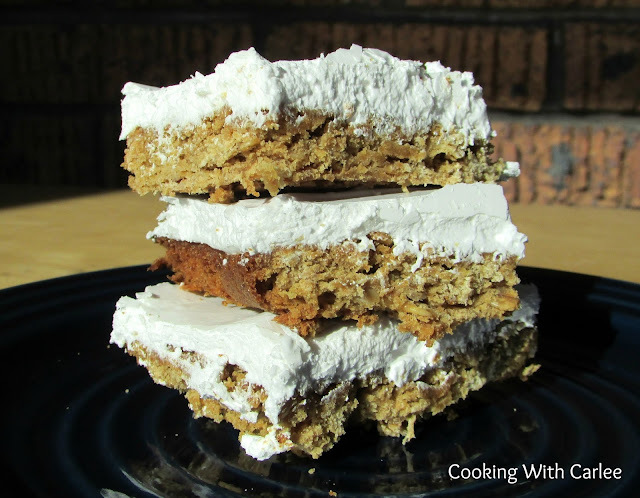 Oatmeal and marshmallow is such a wonderful combination, these bars sound delicious! Thanks for sharing at What'd You Do This Weekend?! Thank you! We really enjoyed how the dark chewy molasses and oatmeal played against the fluffy white frosting! These look amazing! Thank you for liking up to this week's Tasty Tuesday linky! I have pinned your recipes to the Creative K Tasty Tuesday Pinterest board. I hope that you come back again on Tuesday. Yum! I wish my mom put these in my lunch when I was a kid! I guess I can start putting them in my boys lunches when they are old enough to go to school. Thanks for sharing these delicious bars with us at #TalentedTuesday. Sometimes I get carried away thinking about all of the fun things we'll do with Jax when he is a bit older. Sometimes the thought of him getting older and going off to school makes me sad! We like to make treats for daycare though, so that is good enough for now! In fact, he and I have a cookie baking date for tonight! Thanks for hosting, AJ. Have a wonderful evening! Oh these look like a great treat. Molasses is not something that we use here but I like the sound of it! I usually only use it in gingerbready type recipes, but it added the perfect flavor to these oatmeal bars. I need to experiment with it more!